Download the patterns you like from here. The number of copies of each shape you need is indicted on the pattern. 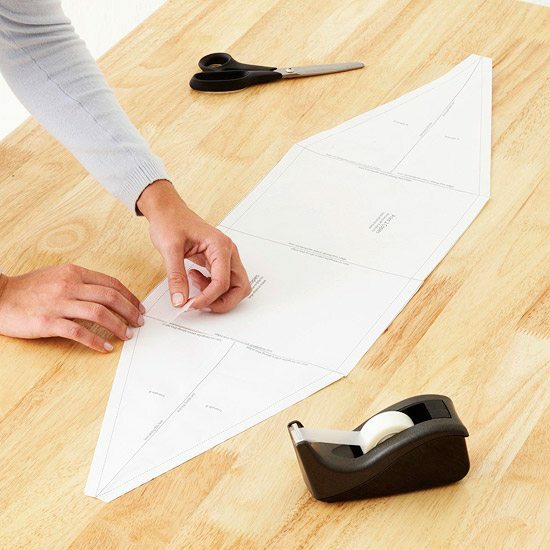 Cut out the shapes and using tape, piece together the larger pattern following instructions. When it is pieced together, the pattern will look like a rectangle with two triangles on each side. Piece and tape together the endcap pattern. 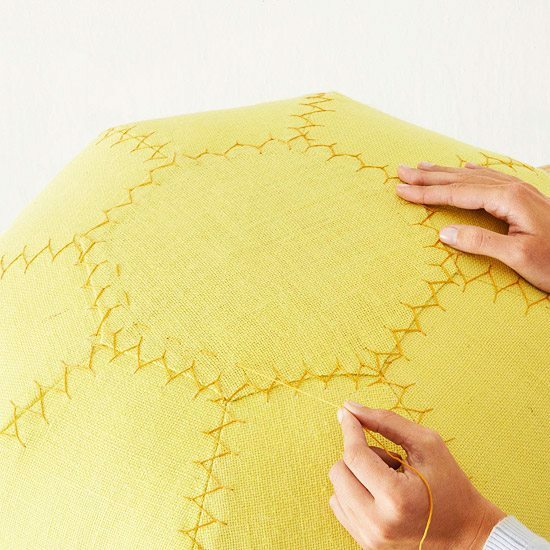 Lay the burlap you just made over the bed sheet and pin the pattern into place and cut around the pattern. Repeat until you have eight sets. This means you will eight pieces of burlap and eight pieces of bed sheet in total. 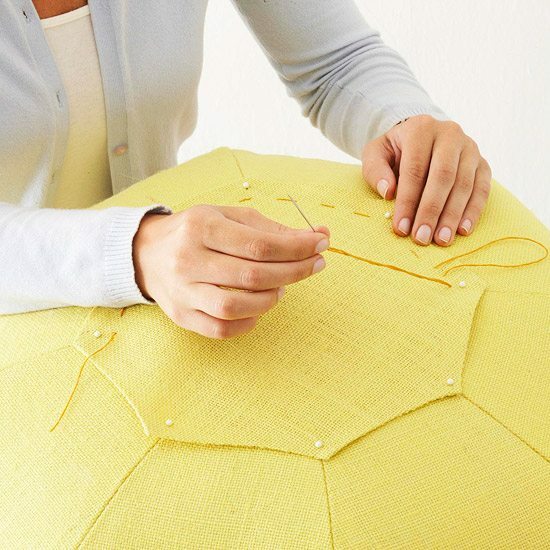 Cut the octagon pieces from top and bottom using the endcap pattern for the top and bottom of the pouf. 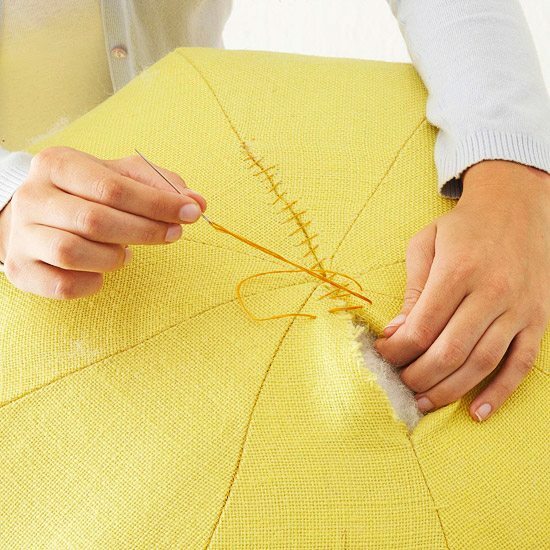 For each piece fold a piece of burlap in half pin the long edge of the endcap pattern along the fold, and cut it out. Repeat to make the second octagon piece. Layer one bed-sheet piece on the bottom, two pieces of burlap in the middle, and one piece of sheet on top. 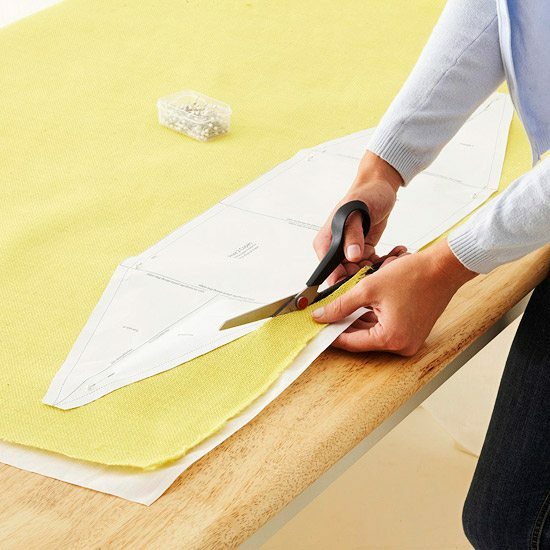 Pin the layers together along one side and repeat this to create three more sets. 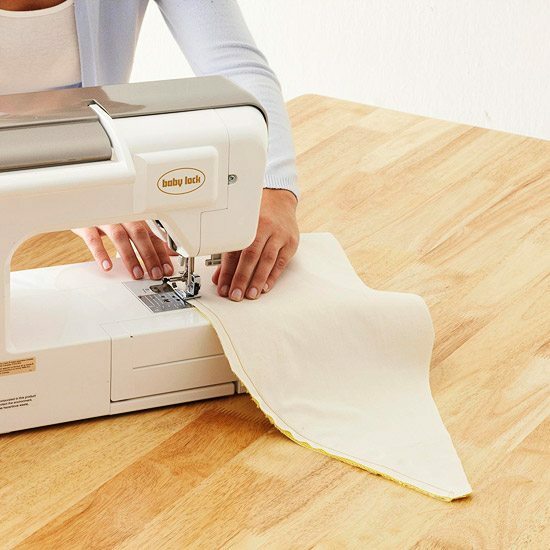 Straight stich with a ½-inch seam allowance. Open up each pair in the middle with the burlap and steam iron them. Lay one joined pair on top of another with right sides together (burlap to burlap) and pin. 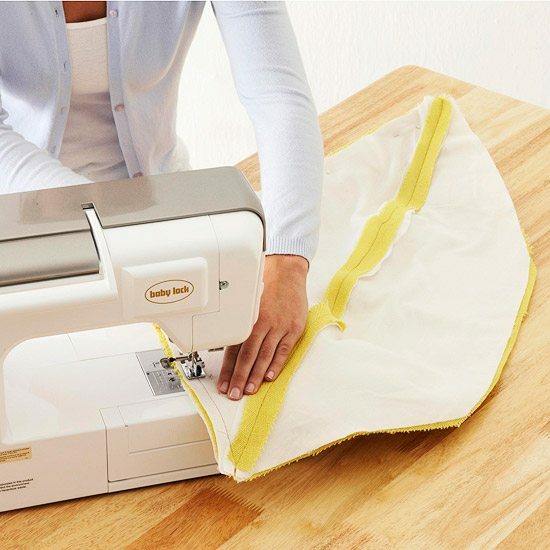 Sew along one edge, unpin, and press open. Repeat with the other two layered sets. 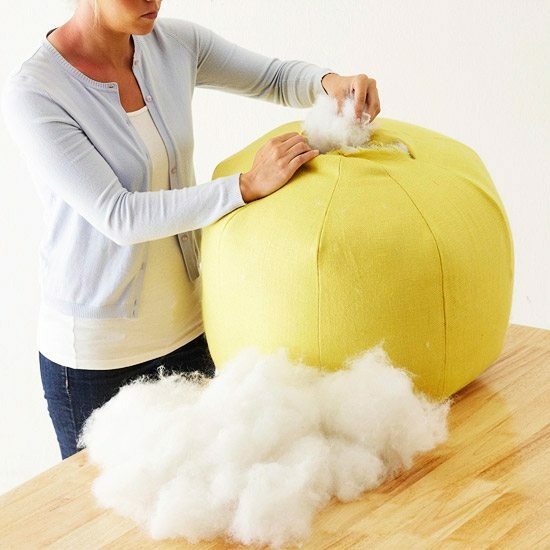 You will have two pouf halves. Turn one half right side out and the other inside out. Nest one half inside the other with right sides together; pin around the outside edges. 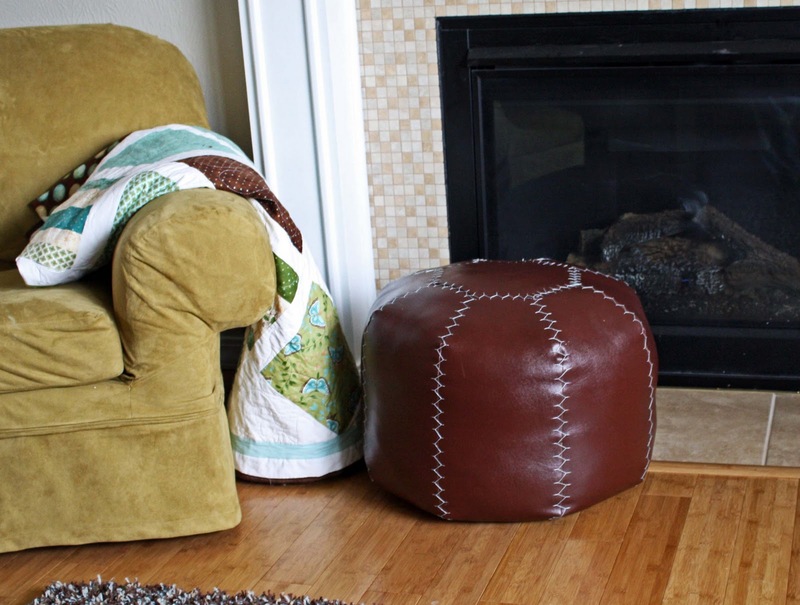 On each end of the pouf where the seams meet, make a mark 5 inches from the center on each side, leaving a 10-inch gap. 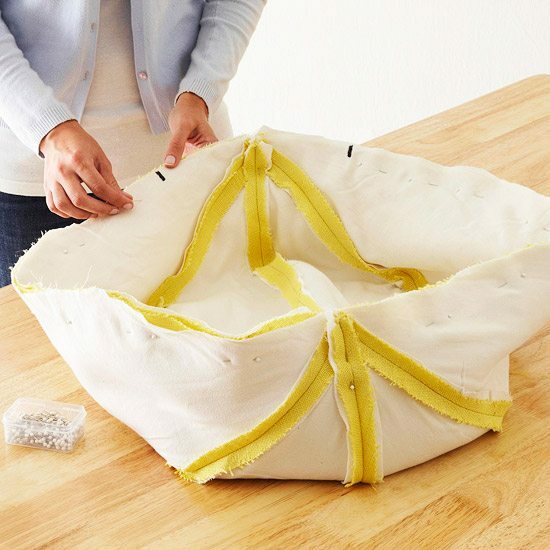 From one 5-inch mark, stitch around the outside edge of the pouf, stopping at the 5-inch mark on the other side, leaving a 10-inch opening for stuffing the pouf. 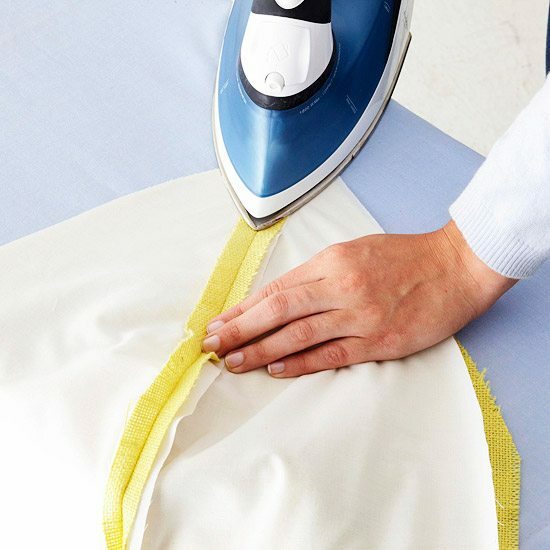 Reinforce the opening by sewing across the seam allowance at a right angle to the seam at the 5-inch marks.